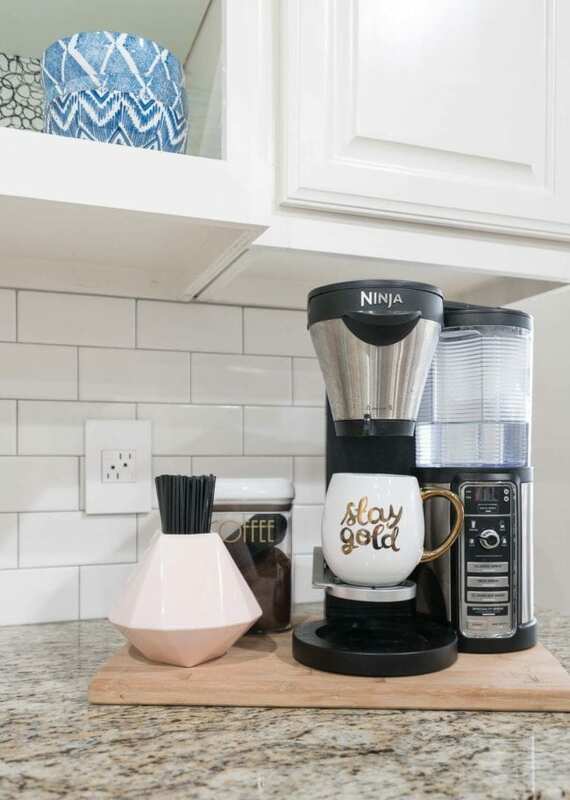 You are here: Home / DIY & Crafts / 5 Ways to Use One Small Vase – Fast Friday! Buying multi-purpose decor is a great way to save storage space and cash. You’ll be able to move the item around your home to get fresh looks for FREE after the original purpose. I still make some purchases with specific rooms in mind, but the decision to buy is much easier when I can visualize the item in more than one area. For example, I love navy throw pillows and white planters because both they work throughout our home. 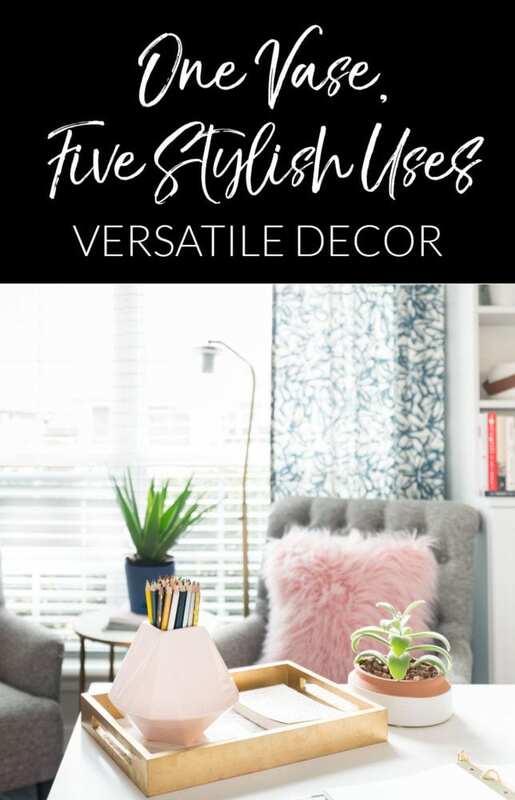 When I saw this blush vase, I knew it would share that same versatility. I was with my friend Katie from It’s In the Details when we spotted the vase. Before we knew it, we were in the checkout line! Since I’m always curious how other people use the same products, we decided to share our ideas together today. So, I’ve got 4 quick ideas in honor of Fast Friday. Then you can pop over and get her quick tutorial for creating a gorgeous, but affordable flower arrangement. 1) Pencils/Pens – Don’t feel limited by the office supply store when decorating your office. My colored pencils suddenly looked chic on my desk when I added them to this vase. 2) Faux Plants – The shape isn’t ideal as a real plant planter, but sometimes faux is the way to go. I picked up a succulent stem and dropped it into the vase for an instant impact. The oversized stem elevates the vase from a small accent to a big statement! 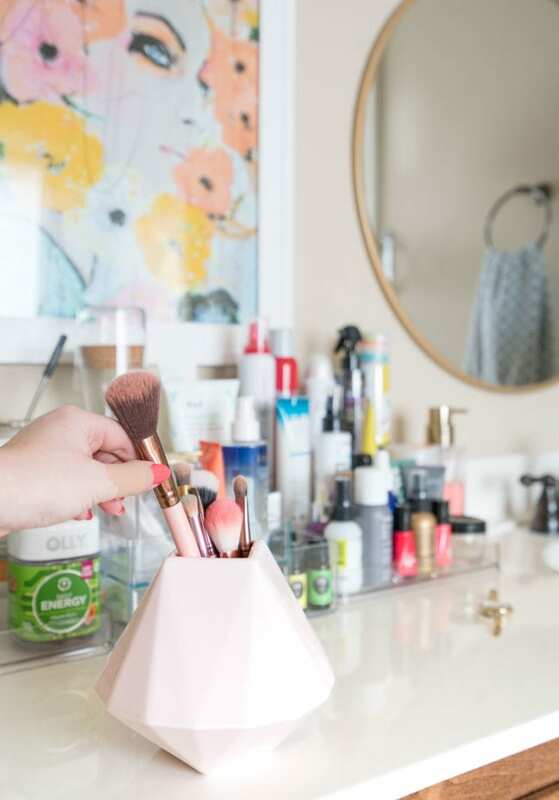 3) Stylish Makeup Brush Organizer – I love the vanity organizers I shared back in this post, but if I didn’t have the separate vanity in the closet, I’d totally be using the vase for my brushes in the bathroom. 4. 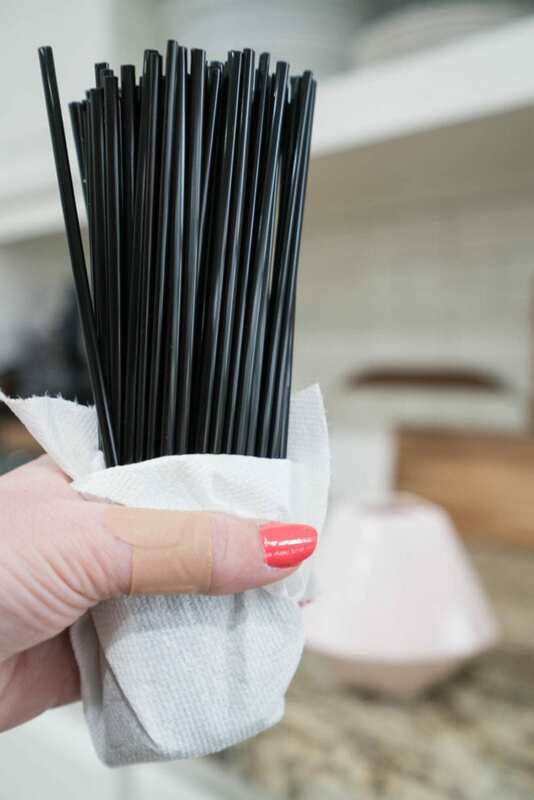 In the Kitchen – We use the same cocktail straws for both coffee and actual cocktails. They fit perfectly into this magical multi-purpose vase! This was the ONLY item that was more involved than just plopping things into the vase, but in this case “more involved” equals about 30 seconds. I grabbed a paper towel to create a clean liner between the straws and vase. PS: I painted my nails before I took these photos so I’d look like I had my stuff together in life. Then I was cleaning up supplies from the hallway wallpaper installation and dropped a box knife on the counter, which then bounced and ricocheted back up into my other thumb, blade up. Hence the band-aid. I decided that I’m way too clumsy for us to own a box knife without a retractable blade. And that sometimes you can’t hide that you’re really a hot mess. 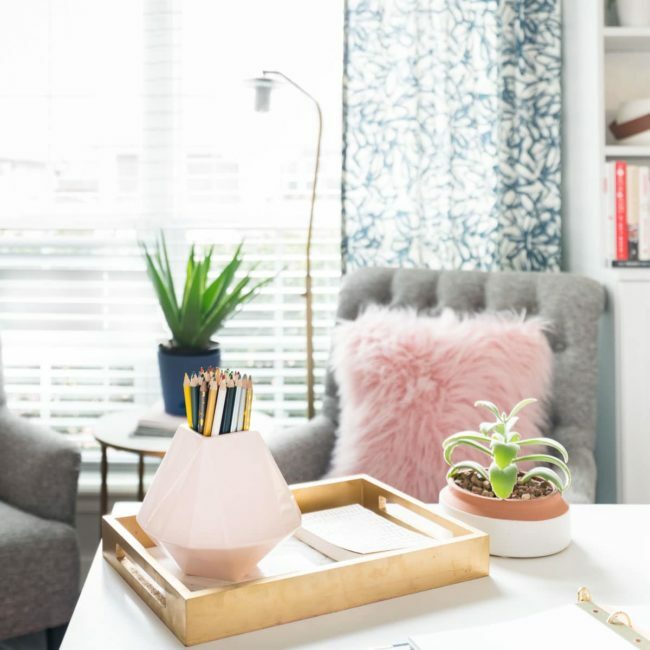 For the 5th and most gorgeous way to style this vase, head over to see Katie! after popping to West Elm to order this versatile piece! She’s a master of easy to recreate floral arrangements and I LOVE what she put together. Make sure to sign up for her newsletter or follow her on social media while you are there. She’s a newer blogger with TONS of great, but not overwhelming, ideas for entertaining – like starting a cookbook dinner club! 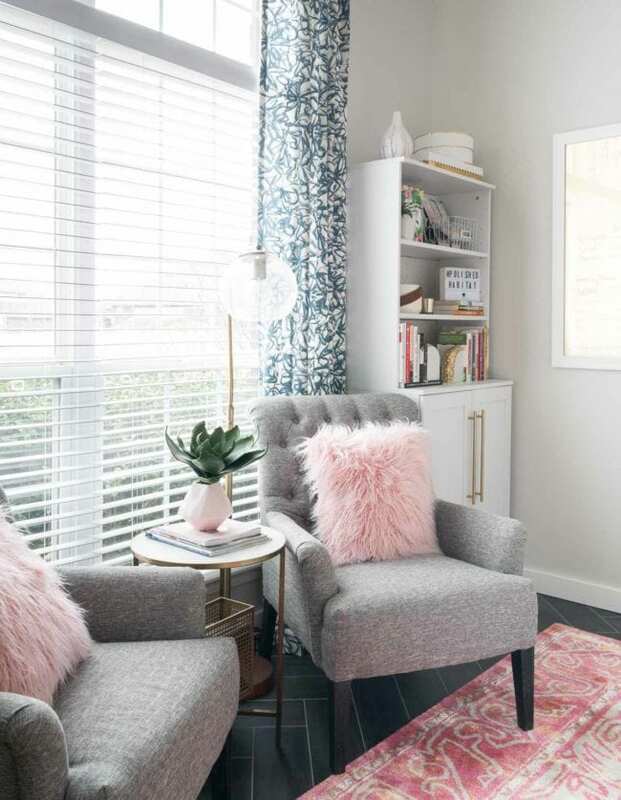 Love the ways you styled this! You are so creative! Such a pretty way to organize! So glad we both have great taste. Ha! Xo! We DO have great taste. 🙂 Thanks for inspiring me to be brave enough to try mixing more than one kind of flower + filler. It’s my default safe option and your flowers look SO much better! I need to go to Trader Joe’s this weekend! Love the fact that you stay real!! (The box cutter ordeal). Heal fast! All wonderful uses. What a time saver. Also, when you get tired of it in one area, you can use it in another. Thanks for sharing. Love the case. Where can we purchase it? You probably said but I missed it. Lost my glasses! Also. In your office I saw the pink fur pillow. Please tell where I can find one. Love love love pink! Thanks for all the ways your share REAL with your readers! We identify with you on so many levels! Great ideas! I love a good versatile piece and this one is so pretty!